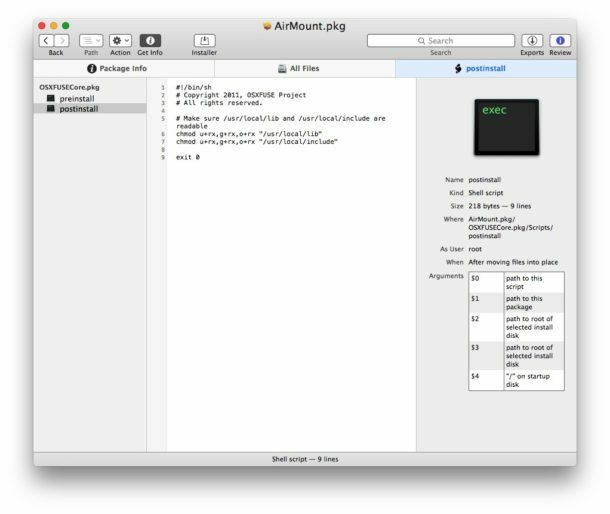 Many Mac applications and downloads arrive as a PKG package file, but have you ever wanted to open a PKG file to view exactly what is being installed and where it’s going from the source .pkg? 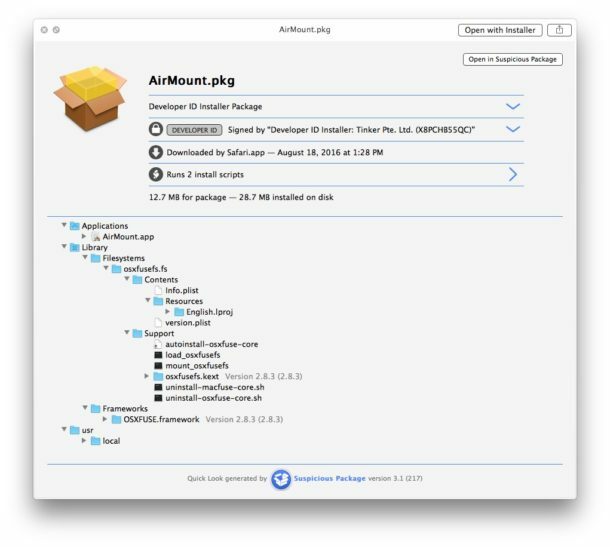 Assuming you get a .pkg installer from a trusted source like Apple there is generally nothing to be concerned with about running a package installer file, but not all PKG installers are as trustworthy. Additionally, sometimes people are just curious about what exactly is going on behind the scenes, and what is going to be run by the package installer and where it intends to put files on a Mac. This is where the amusingly named ‘Suspicious Package’ application comes in to play, it’s a free Mac app which allows the opening and inspection of PKG installer files before the installation is actually executed, giving you a look at what is going to happen when the PKG is run. Once Suspicious Package is installed, you can give it a try by dragging any PKG installer file into the application, or selecting a package installer in the Finder and hitting Command+Spacebar to activate Quick Look on the package in question. While all of this is informative to any and all users, it’s really intended for advanced users who encounter package files from dubious sources or that are otherwise questionable. If you’re downloading all of your apps, updates, and packages from Apple.com or an equally trustworthy location, you may find Suspicious Package to be interesting but not particularly noteworthy since the source is trusted, though even packages from Apple can encounter weirdness like having a pkg get stuck on Verifying which can sometimes be troubleshooted through a utility like this. 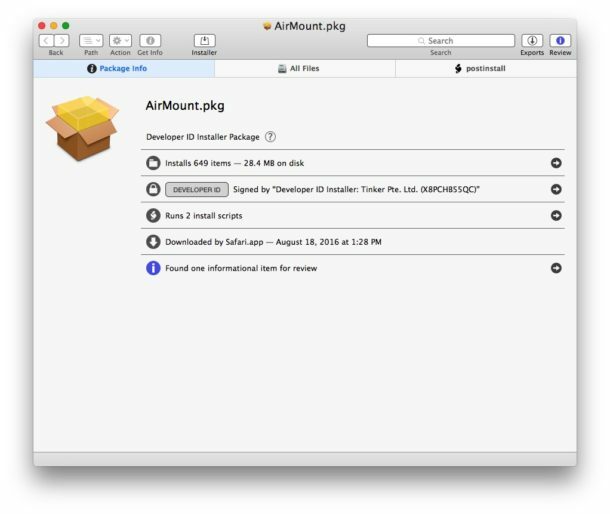 Where Suspicious Package really gets useful is in more advanced situations where higher Mac security is necessary and where users want to be sure a file is trusted and an installer isn’t doing anything sketchy when it’s run. 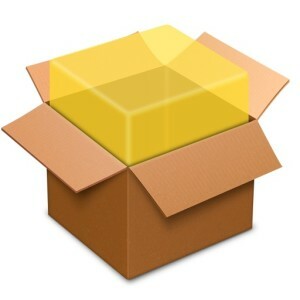 Longtime Mac users may recall that a package inspection feature used to exist in Mac OS X some time ago via the right-click menu, but that feature has since been removed. More advanced Mac users can still extract pkg files with pkgutil without actually installing them but it requires the use of the command line, and the Show Files method to see what files are going to be installed and where to is not always available or detailed enough. Suspicious Package requires a relatively modern version of macOS or Mac OS X to use. Mac users with older system software can try Pacifist which performs a similar ability to dig around in PKG files if interested. Cool little app, thanks for the heads up. Looks promising, I’ll try it soon. Another easy way to inspect a package is through The Unarchiver. Right-click > Open with > The Unarchiver. A lot of the time, you can even extract the app and just run it from the folder (don’t do this unless you have a good reason). Alway game for apps like this that are free and help, especially for someone like me still learning my way around the iMac way. Thanks, one of the best things I did was subscribe to these daily tips. Have had this installed for years now, along with Pacifist. It’s always a good idea to know exactly what you’re putting into you Mac. will extract the contents on the package to dir-path. 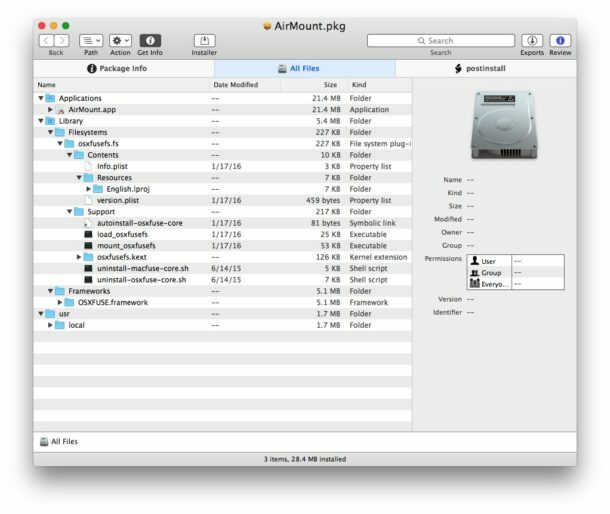 You can create ramdisk for this purpose and then inspect the files there. these payloads may themselves be further *.pkg files if this is a installer for a suite of software, rather than single app. This also allows you to modify the installer, skip OS version check etc before you run the installer.